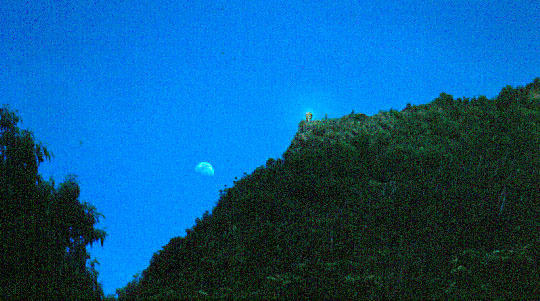 Pohaku-o-Kane, perched atop the ridge, keeps an eye on Haena. "There are two places on this island that have Menehune names and have names given by other people," says Carlos. 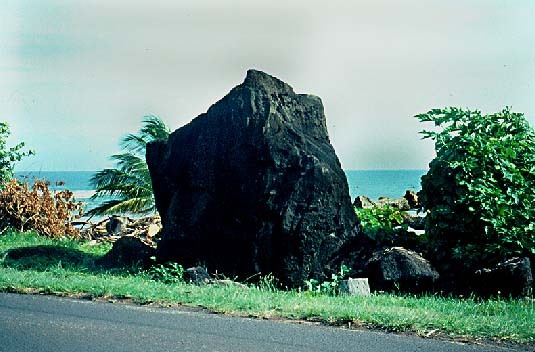 "One is a rock the Kane people call "Pohaku-O-Kane," but it has a Menehune name. And on the other side of the island , at a place on the Koloa side, there's another big rock. The "other story" about that rock is about a man who encountered Hiiaka, when Hiiaka was doing her journey here, and Hi'iaka wanted passage or some fish or something, and the man said, yeah, I'll give you some fish, but I want your body, and she said "okay" and she opened her pau, and when she opened her pau and he looked, he turned to stone. And right there is a tale of proper behavior: you don't solicit from a woman, or force her to give you her body in exchange for food, or passage, or whatever, it's not proper behavior." "Long before humans discovered Kauai, a family of three huge rocks, two brothers and a sister, were seeking a new home. They rolled across the ocean floor, visiting several islands and atolls before finally arriving at the north shore of Kauai. As they approached the shore, they were refreshed by the water of Limahuli stream. Breaking the surface, they saw that they were on a reef surrounded by fish. The colors of the land, ocean, sky, and clouds delighted them." "Ooaa, the sister, was enchanted with this spot and decided to stay. Basking in the warm sun and lulled by the sound of the waves, she soon fell asleep. The brothers, wanting to go insland, rolled onto the sandy beach. After a while the younger brother, Pohaku-loa, stopped to rest in the shade of hala trees. Enjoying the rustling leaves and cool breeze, he decided to stay. Although his older brother pleaded with him to continue up the mountain, Pohaku-loa contentedly fell asleep. Pohaku-Loa sleeps by the side of the road near the base of the ridge. "The older brother continued alone, intending to climb to the top of the mountain. When he reached the pali (cliff) his strength and determination were not enough. He faltered and fell. Again and again he tried to reach the top, refusing to give up. Eventually, the great god Kane noticed this ambitious rock and went to investigate. He asked the rock why he was struggling so hard to reach the top. The rock replied, 'Because I want to be where I can watch the world below. "Kane pointed out that it didn't matter where the older brother was, for he would surely fall asleep as his brother and sister had. The older brother insisted that he would remain awake. Kane decided that this determined rock would never give up, that he would continue to climb and fall until all that remained of him was dust. So Kane and the rock made a deal. Kane lifted the older brother and placed him on the top of the mountain ridge. In return the rock promised to stay awake and watch and remember all that went on below him. Then Kane said, 'When I come again, you must tell me what you have seen. When you are ready to go, the island will sink beneath the waters and the waves will climb up to you. Then you and your brother and sister may begin to travel again. Until then, watch and remember'." Frederick Wichman adds that Ooaa ("fast-rooted one") was moved from Hauwa reef by the 1946 tsunami, and now lies in the depths. She is still waiting for her brothers offshore and can be seen by snorklers.